Apple will start selling the Bluetooth earphones in-store next week. Apple is releasing its wire-free Bluetooth AirPods in time for Christmas, skating under the wire juuuuust barely by making them available to order online today with an initial ship date of December 21. AirPods will also be available in Apple Stores on December 21, Buzzfeed reports. Update: The latest reports say that Apple will start selling the AirPods in stores on Monday, December 19. In addition to Apple Stores, carrier stores and authorized retailers will also be getting shipments next week, according to MacRumors. Apple announced the AirPods back in September alongside the headphone jack-less iPhone 7 and 7 Plus, positioning the $159 earphones as the perfect accessory. But then the pre-announced shipping date—sometime in October—came and went with no AirPods to be seen. Rumors swirled last week that Apple was troubleshooting connectivity issues with the AirPods, which operate independently of each other. The earphones are unusual in that they lack buttons for controlling the volume and song playback, instead relying on double taps and Siri commands. The AirPods use Apple’s W1 chip, which the company claims will solve the connectivity issues that have plagued other Bluetooth earphones. Apple’s BeatsX earphones use the same chip, but won’t ship until next February. 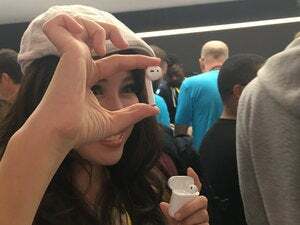 We went hands-on (ears-on?) with the AirPods at Apple’s iPhone launch event in September and loved the ease of using them. Setting up your AirPods is more seamless than pairing other Bluetooth earbuds to your iPhone—just open the accompanying charging case near your iPhone and tap to pair with every devices connected to your iCloud account. The impact on you at home: Apple will likely have limited supply of AirPods at launch—at 10:30 a.m. Eastern, shipping estimates had already slipped to four weeks. It’s unclear how many AirPods will be on store shelves on Dec. 21, but if you want to snap up a pair before Christmas, in-store shopping is your best bet.